With the popularity of C.S. Lewis's ​The Chronicles of Narnia -- both the books and the motion pictures, it's no surprise that fans are always looking for more. Here are eight great Narnia card and board games everyone will love. For 2 to 4 players, designer uncredited, published by Milton Bradley / Hasbro (2005). Players take on the role of Peter, Susan, Lucy or Edmund and try to escape the White Witch and avoid wolves. The first to travel through Narnia and return to the lamppost wins the game. Each character has a special ability, and Aslan tokens help protect the children from danger. For 2 to 4 players, designer uncredited, published by The Games Team (1988). This game, published in England, is based on the BBC version of the Chronicles aired in the late 1980s and early 1990s. It features two interlocking wheels, one for Aslan and one for the White Witch, which are rotated throughout the game. Players compete to be the first to collect sets of cards which make up scenes from the story. For 2 or more players, designer uncredited, published by Carta Mundi (2005). Shield-shaped cards (52 of them) feature various characters from the movie version of The Lion, The Witch, and the Wardrobe. The cards are placed face down in two 4 x 6 grids, with each player's special Lion and Witch cards placed at the end and then each player, in turn, rolls a six-sided die. The die has a different symbol on each side; players try to find a card that matches the symbol they roll. If they find a match, that card is removed from the game. The first player to build a path to the Lion card wins. For 2 players, designer uncredited, published by Sababa Toys (2008). The Shield of Courage, a card game based on the motion picture Price Caspian, is an excellent two-player game. Players compete to win five of the nine courage shields by playing cards in sets of three. Fans of The Chronicles of Narnia will recognize many of their favorite characters, including High King Peter, Queen Susan, King Edmund, Queen Lucy, Trumpkin, Glenstorm, Asterius, Tyrus, and of course Prince Caspian. For 2 to 4 players, designer uncredited, published by David C. Cook Publishing (1983). 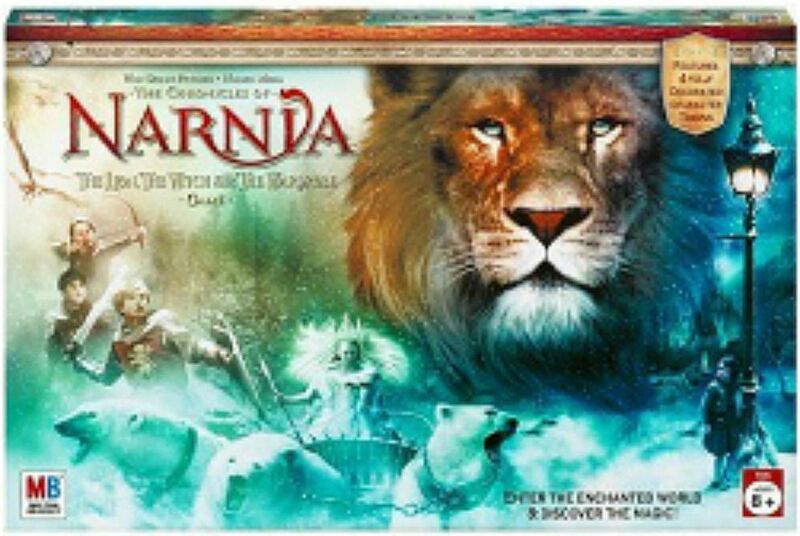 Players join Prince Caspian's army in this board game, competing to be the first to reach the magic horn in the center of the board and get the "victory" card to win. Along the way, many obstacles will stand in your way, such as Nikabrik the dwarf. For 2 to 6 players, designer uncredited, published by Sababa Group (2008). This game was unveiled at the 2008 American International Toy Fair. I have not played it, nor could I find much about it online other than the company's promotional text: "Things have changed from the peaceful land the Pevensie children left behind 1300 years ago. Narnians have been forced to find refuge while living in fear of the evil Miraz. Prince Caspian is the ray of hope in restoring things as they once were but he will need your help to battle Miraz and return the rightful heir to the throne. Join all your favorite Narnians and return the rightful heir to the throne." For 2 to 4 players, designed by Richard Borg, published by Hasbro (2006). This themed edition of Risk, designed for ages 8 and up, introduces characters into the Risk gameplay. Aslan, Peter, Lucy, Susan, and Edmund are all featured, along with Mr. and Mrs. Beaver and several others. One player is the White Witch; the others control the armies allied to Aslan. This game was met with mixed reviews. For 2 players, designer uncredited, published by Milton Bradley / Hasbro (2005). This, obviously, is Stratego with a Narnia theme; it can be played with classic Stratego rules or using special powers. In the special powers game, the blue army (White Witch) has two ways to win: capture the red army's (Aslan) flag, or remove all four children from the game. Some of the special powers include: The White Witch can turn opponents to stone or enchant them with Turkish Delight; a Cyclops can go on a rampage and attack more than one enemy at a time; Susan can use her arrows and the Ivory Horn; Lucy can use her Healing Cordial; and Aslan can undo a "turned to stone" spell cast by the White Witch.